3 Exceptional Keynote Speakers ! We Are Thrilled To Announce 3 Exceptional Keynote Speakers from La Banque Postale, BNP Paribas & ING ! 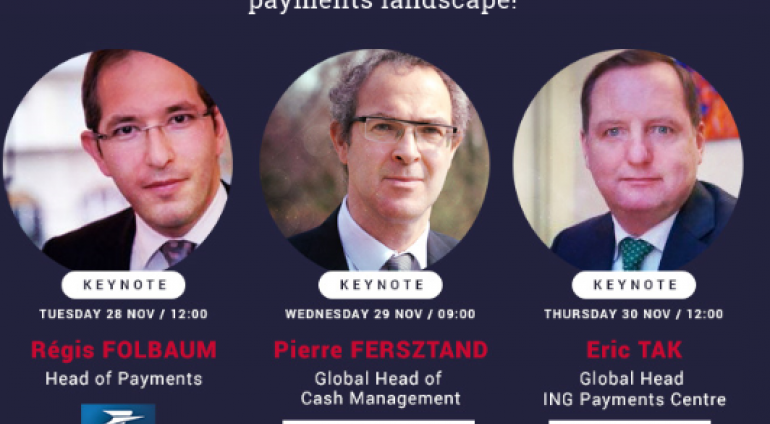 JOIN US as 3 major banks share their story on how they drive innovation in the current global payments landscape ! Régis Folbaum is the Head of Payment and a member of the Management Committee of La Banque Postale. From 2012 to 2015, he was the General Manager of MasterCard France. Prior to taking this role, he held several positions in the Financial Institutions Group of global management consulting firm McKinsey & Co. and in the Mergers & Acquisitions teams of AGF–Allianz Group, and Goldman Sachs. As part of his role, Régis Folbaum is also Vice-President of GIE Carte Bancaire, Vice-President of Visa Europe France, a Board member of Transactis and a Member of Banque de France Conseil National des Paiements Scripturaux. Pierre FERSZTAND is Global Head of Cash Management for the BNP Paribas Group since July 2005 and reports directly to the Deputy Group CEO, Thierry Laborde. In 1998, Pierre joined BNP Paribas where he was responsible for the creation of innovative products, services and solutions. He was then appointed as a General Manager of Interbank society (SEME and then BMS) to launch the electronic purse “Moneo” in 1999. "Partnering and Innovation to Stay a Step Ahead"
Eric Tak is Global Head of ING’s Payments Centre, responsible for defining the bank-wide Payments Strategy and execution of the bank-wide roadmap for all segments across the ING network. Eric joined ING as Global Head of Cards in 2011 following his experience as Director of Cards Products and iDEAL with Dutch payments scheme management company Currence from 2005 onwards.